2017 had the most drug approvals this decade, more than double the number approved in a disappointing 2016. The FDA approved 46 new molecular entities and many other approvals for new indications, dosage forms, and formulations. 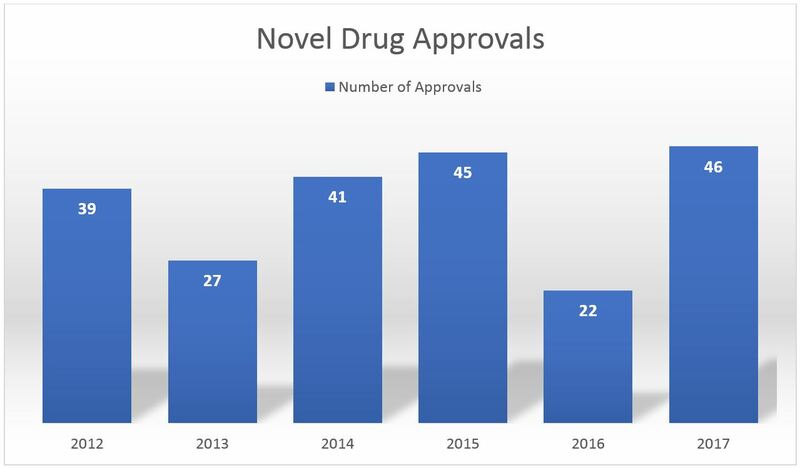 The following chart depicts the number of new drug approvals in recent years. Oncology is the therapeutic category with the most drug approvals in 2017. The FDA approved 11 new drugs for different forms of cancer: Aliqopa, Alunbrig, Bavencio, Besponsa, Calquence, Idhifa, Imfinzi, Kisqali, Nerlynx, Verzenio, and Zejula. Neurology increased from four in 2016 to seven in 2017. The new medications for neurological conditions are Ingrezza for tardive dyskinesia, Austedo for chorea associated with Huntington’s disease, Brineura for Batten disease, Emflaza for Duchenne muscular dystrophy, Ocrevus for multiple sclerosis, Radicava for ALS, and Xadago for Parkinson’s disease. Two new treatments for plaque psoriasis, Siliq and Tremfya, and one treatment for rheumatoid arthritis, Kevzara, were approved in 2017. Ozempic and Steglatro were approved for patients with Type 2 diabetes in 2017, up from one new drug approval in 2016 (Adlyxin). 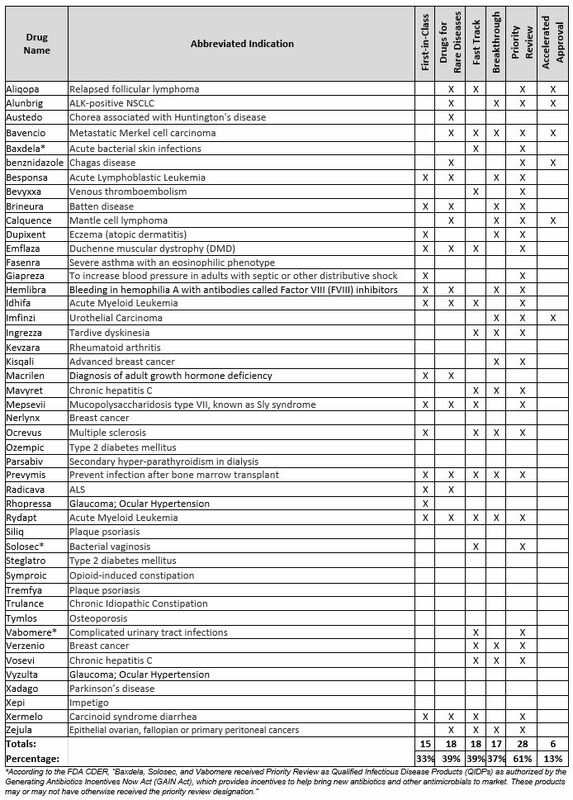 PHSI analyzed the FDA approvals and categorized them by approval type, indication, and other factors, as shown in the following table. PHSI identified drugs which were considered First-in-Class, and those that are Drugs for Rare Diseases, also known as orphan drugs. 2017 was a big year for orphan drugs, representing nearly 40% of new drug approvals. PHSI segmented approvals by timing considered by the FDA including Fast Track, Breakthrough Therapy, and Accelerated Approval. In some cases, more than one accelerated designation was employed to help bring the drug to market. This article only contains new molecular entities approved in 2017. To see all of the over 4,000 approvals that occurred in 2017, please visit the FDA’s Drugs@FDA website. U.S. Food and Drug Administration. “Novel Drug Approvals for 2017.” Last Updated January 11, 2018. Available https://www.fda.gov/Drugs/DevelopmentApprovalProcess/DrugInnovation/ucm537040.htm. Accessed January 11, 2018. U.S. Food and Drug Administration Center for Drug Evaluation and Research. “Advancing Health through Innovation: 2017 New Drug Therapy Approvals.” January 2018. Available https://www.fda.gov/downloads/AboutFDA/CentersOffices/OfficeofMedicalProductsandTobacco/CDER/ReportsBudgets/UCM591976.pdf. Accessed January 11, 2018.